A typical raised floor consists of modular, load-bearing, concrete-filled steel floor panels 0.6 m x 0.6 m (2 ft x 2 ft) square supported on pedestals at a height of 0.3 - 0.46m (12 - 18 in.) above the concrete structural slab of the building. The pedestals are glued to the structural slab and the panels are typically attached with a screw to a pedestal at each corner, allowing them to be easily lifted and removed for access to cabling or equipment within the underfloor plenum. 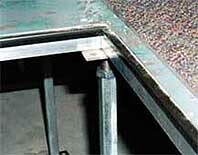 In some States, compliance with local building codes may require additional structural stability for deeper plenums. 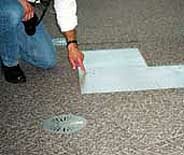 California's seismic requirements, for example, can be met by installing a stringer system and diagonal bracing. Openings can be cut in the panels for workstation connections to voice, power and data cabling, or for the insertion of UFAD floor diffusers. Many raised floors have carpet tiles laid on top, to provide a finished surface, which also permit the easy insertion of corresponding openings.Such flexibility is important considering the high churn rates of contemporary buildings.